The concept of speed, especially when delivering a customized CNC machine, has changed dramatically over recent years. Buyers look to vendors to engineer, manufacture and deliver to their exact timelines. Recognizing this as a concern in the industry, AXYZ implemented a systematic approach that offers the shortest lead times possible, averaging just 4 to 6 weeks. Compared to the competition, at 8-10 weeks, this is quite an accomplishment. Typically, custom machines take longer to manufacture. When a CNC Router table is enhanced or changed significantly by a customer, the lead time increases to 12 weeks. Again, compared to the competition at 18-24 weeks, AXYZ’s lead time is still quicker. What makes us so fast? AXYZ’s ability to manufacture a CNC Router table quickly and efficiently evolved gradually over the years. From 30 weeks in the early 1990’s to the current 4-6 week average, AXYZ’s well-equipped facility ensures quality and speed go hand-in-hand. Whether it’s a custom-made machine or the latest model from our product line, AXYZ ensures customers receive exactly what they want at the due date specified at the time of order. An integral part of this process is providing the customer with regular updates every step of the way. Important to note is that it’s not the type of table that dictates speed, but whether it can be delivered in one piece versus sections. Any table between 8’ x 24’ and kept in one piece for delivery is usually the quickest table to manufacture. If a table has to be sectioned for international shipping purposes, then delivery time increases. An example is the AXYZ 8010 Series router table. 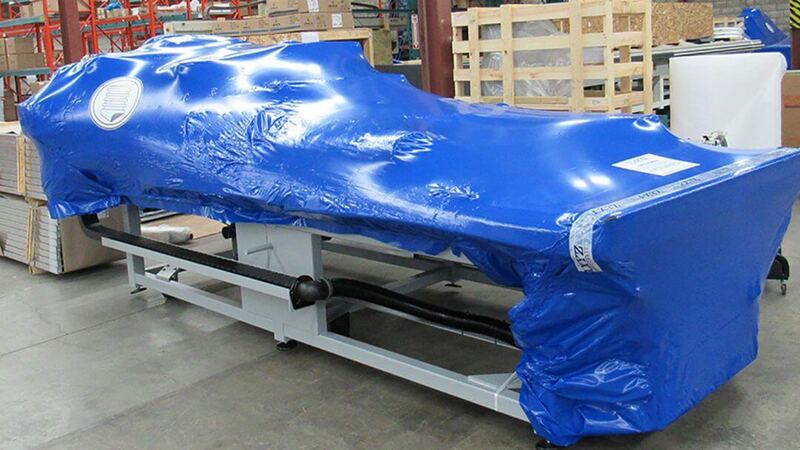 This massive 8’ wide table supports a host of production enhancements including oscillating and tangential knife heads, as well as the state-of-the-art AVS camera registration system for print to cut applications. AXYZ engineered, delivered and installed the table in one piece to a local retail customer in Paris, Ontario within 4-6 weeks. This delivery time would have increased if they were located abroad, as the table would be sectioned in two pieces to fit an ocean liner needed for international deliveries. Knowing how to leverage the right technology helps to make the process run smoothly and assists with speedier results. At AXYZ, a total of three 3D printers can be found in the facility that are in constant use by engineers and innovation specialists. “Whereas other people use 3D printers for research or prototypes, we use 3D printers in a production environment.” states Jackson. “Our 3D printers are usually running 24/7.” In addition to 3D printers, AXYZ also uses vertical milling stations, CNC lathe machines and runs its very own cut shop. This ensures that each table is made with the best material in the least amount of time – a success factor that gives AXYZ a competitive edge in the industry. Whether you need a CNC Router table quickly or have ideas for the future, contact AXYZ today to discover your options.